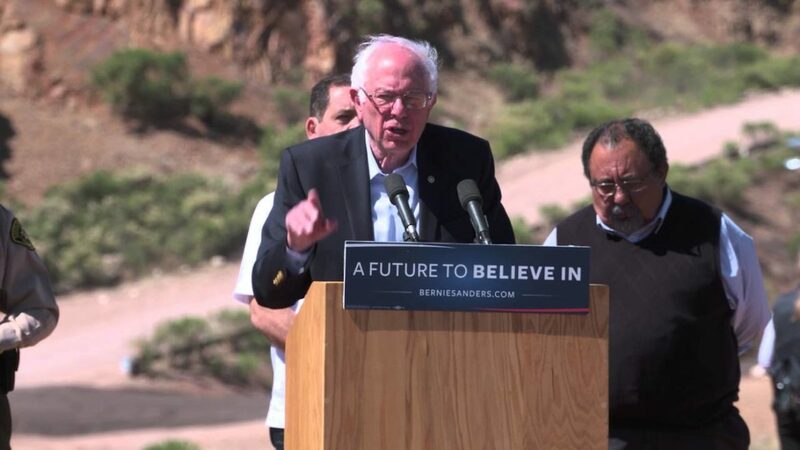 Presidential candidate Bernie Sanders speaks at the U.S.-Mexico border in March. From 76 cents to Hillary Clinton to the $5,400 maximum for a variety of candidates, more than 5,000 New Mexicans kicked in cash to presidential campaigns through the end of April. More than half those donors are giving in repeated small amounts to Democrat Bernie Sanders, who far outstrips all other candidates in number of donations received. The Vermont Senator has received 18,879 donations, compared to 5,346 given to Clinton through April. These donations include, in many cases, multiple donations from the same person. As New Mexico In Depth reported last week, Sanders is leading the presidential candidates when it comes to total sum of New Mexico donations ($896,675), with Democratic frontrunner Hillary Clinton close behind ($856,870). But his average donation is $47, compared with a $160 average for Clinton and $266 for presumptive Republican nominee Donald Trump. Former New Mexico Gov. Gary Johnson, the Libertarian presidential candidate, had the highest average donation of $878. Don’t let Sander’s small average fool you. Some New Mexicans are still forking over the big bucks to Sanders, just in smaller, more frequent sums. Take Robert Nuchow of Albuquerque. He’s donated more than $3,100 – in 167 installments, starting last July. His donations range from $3 to $121. Kate Schultz, of Las Cruces, made 107 donations to Sanders totalling $1,659 starting last October. She said she agrees with Sanders on the issues, and is inspired by his candidacy. Susan Nunnally, of Rio Rancho, describes herself as a constitutional conservative, and held a similar enthusiasm for her presidential candidate, Texas Sen. Ted Cruz. She donated to Cruz’s campaign 63 times in amounts ranging from $15 to $500 for a total of $4,273. But Nunnally is frustrated by the media attention bestowed on Trump and Clinton, which she says outweighs any fundraising prowess by competitors. One of those donors, James Smith, of Santa Fe, gave to two candidates: $1,150 via 10 donations to Republican Ben Carson and $683 via 49 donations to Clinton. Smith is one of more than 130 New Mexico donors who gave to more than one candidate. But only about a handful gave to both Democratic and Republican candidates. And only nine Democrats split their donations between two candidates. Albuquerque attorney Don Bruckner donated $2,700 each to Cruz, Sen. Marco Rubio, Ohio Gov. John Kasich and former Florida Gov. Jeb Bush. He also gave $1,000 to Wisconsin Gov. Scott Walker. That $11,800 in total donations puts Bruckner at the top of the list of New Mexicans giving to presidential candidates. Most of those top donors thus far gave to GOP candidates. Then there are state lawmakers. Fourteen of them have donated more than $11,800 to presidential candidates, with more than $10,000 going to Clinton. Democratic Sens. Joseph Cervantes of Las Cruces and George Munoz of Gallup and Rep. Deborah Armstrong of Albuquerque each donated $2,700 to Clinton’s campaign. Only Rep. Antonio “Moe” Maestas, D-Albuquerque, donated to Sanders, giving $100. Three GOP lawmakers donated to Rubio, while two donated to Cruz. None of the state’s congressional delegation have given to presidential candidates thus far. Cynthia Pearce, who is married to U.S. Rep. Steve Pearce, donated $1,000 to Cruz last September. Be sure to like our Facebook page, or sign up for our headlines by email, to ensure you receive New Mexico In Depth articles as they are published.